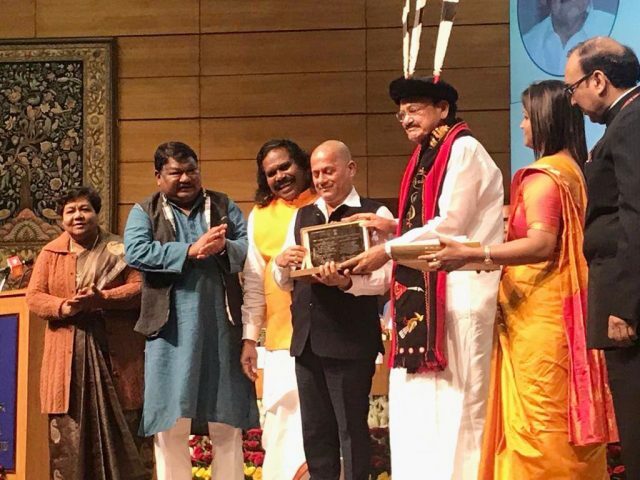 Bhubanswar: Kalinga Institute of Social Sciences (KISS) has been honoured with ‘Leadership Award’ by National Commission for Scheduled Tribes (NCST), Govt. of India. The award was given to KISS on 19th February at a special function in New Delhi. Hon’ble Vice President of India Shri M. Venkaiah Naidu handed over the Award, which carries a citation, medal and shawl, to Prof. Achyuta Samanta, Founder, KIIT & KISS in the presence of Shri Jual Oram, Hon’ble Union Minister for Tribal Affairs, Dr. Nand Kumar Sai, Hon’ble Chairperson, National Commission for Scheduled Tribes, Govt. of India, Ms. Anusuiya Uikey, Vice-Chairperson and other dignitaries. KISS is the first ever institute to get such prestigious award for its services in the field of education for Scheduled Tribes. As a mark of recognition for yeomam services rendered by educational institutes, including universities, colleges and schools, for upliftment of tribal communities through education, the National Commission for Scheduled Tribes have been giving Leadership Award to one educational institute of the country. The award was given in the eve of the 1st ever Foundation Day celebration of NCST and KISS is 1st in the country to receive the Award given by NCST for the 1st time. KISS is a unique initiative of social transformation through holistic education. Founded by noted educationist and social activist Prof. Achyuta Samanta, it is the largest residential institute for the tribals in the world, providing accommodation, food, healthcare and education to the poorest of the poor children since last 27 years. KISS is a home for 50,000 tribal students – 27,500 existing students, 15000 well-placed alumni and more than 10,000 students in its various satellite centers. The institute provides quality education from Kindergarten to Post-Graduation in a fully-free, fully-residential setting. It has the distinction of being the only university exclusively for tribal students in India and the entire world. This kind of model has not been possible across the globe. Expressing satisfaction, Dr. Samanta said, it is a rare achievement. He dedicated the award to all teachers, staff and students of KISS.